Protesters marched close to the Olympic stadium calling for an end to the corporate takeover of the Olympics and the draconian policing and military presence largely aimed at the protection of brands and for the games to meet its legacy promises. The ‘Whose Games? Whose City?’ protest close to the Olympic site had at first been banned, and Transport for London had refused permission for them to march along roads which are emergency backup Games routes. Even after it had been agreed with police that they could do so and that should an emergency arise that meant these roads were needed the marchers could simply be cleared to the pavements, Tower Hamlets Council, owners of Wennington Green where the march was to finish, attempted to ban speeches or other events, and there were threats of arrest should marchers wear political -shirts, display placards or carry of banners. In the event the march went off without trouble, with one minor incident close to its end in Roman Road where police seized and searched one man who had cut a piece of police tape. Despite the attempts of stewards, most of the marchers who had already gone past returned to support him and the police were soon surrounded by a large and noisy crowd demanding his release. After a few minutes he was set free without charge and the march ended quietly with a rally in the park. Around 500 marchers mingled with press and TV from around the world at the starting point in Mile End Park around midday. Police came to liase with the marchers including a number in the light blue liasion waistcoats now common at protests. "the close ties between the Olympic brand and its corporate sponsors who, despite IOC claims of vetting on ethical grounds, include serial polluters, companies which seriously damage the environment and which wreck or take lives, Coca Cola, Rio Tinto, BP, Dow Chemical." "G4S, Cisco, and Atos deny people their human rights in a variety of situations while Macdonalds helps to fuel the obesity epidemic. 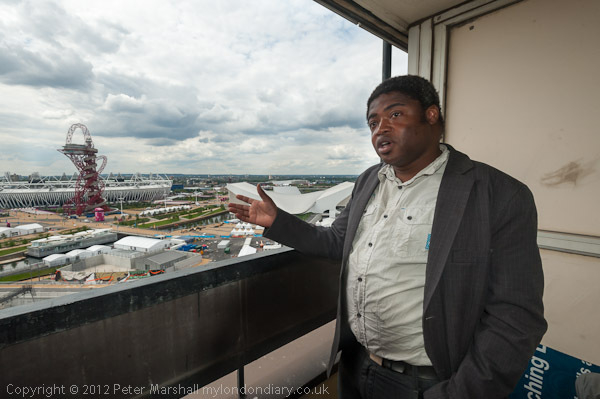 London2012 provides benefits at taxpayers’ expense while receiving little in return." CON also point out the many broken promises so far and the very doubtful legacy the games will leave, particularly in East London. "the lack of benefits for local people and businesses, the fantastic expansion of security into our daily lives, the deployment of missiles and large numbers of troops, the unwarranted seizure of public land at Wanstead Flats, Leyton Marsh and Greenwich Park." "These negative precedents set in so many different fields can be used to justify further massive security operations, the deployment of armed police and drones, the further seizure of land and the breach of planning rules preventing development of open space." At the front of the march were a group of people in wheelchairs from DPAC (Disabled People Against Cuts), incensed by the way that Atos, one of the Olympic sponsors, has been conducting tests on disabled people to determine their suitability to work. The computer-based tests fail to take into account the circumstances of the individual, and those conducting them are trained to unfairly reduce the number of successful claims to a minimum - with a target of one eighth of the current level - Atos get paid for every person they deny benefits. Many people clearly unable to work have lost their benefits, sometimes several times after appeals have been allowed, and some have been driven to suicide. Among those refused are those with terminal ilnesses and 32 people who have been denied benefits have died before their appeals could be heard. Others who received benefits that enabled them to carry out useful and rewarding work have had these withdrawn and can no longer continue, almost always becoming a greater burden on the taxpayer. 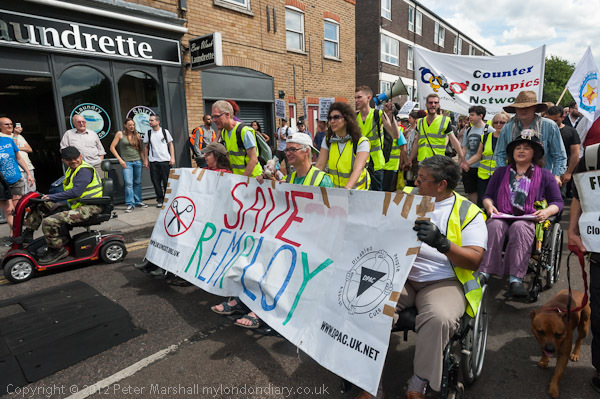 One of the main banners was against the governments decision to close much of Remploy, which enables many disabled people to do productive work. Also on the march were a group of Circassians opposed to the Sochi 2014 Winter Olympics. They say the Olympics in Sochi, a city on the Black Sea coast was the site of the Circassian Genocide, where Czarist Russia killed around 1.5 million Circassians in the 1800s, will be the most corrupt Olympics ever, costing over $50 billion and will cause irreversible damage to a UNESCO World Heritage Site. Get your missiles out of Bow"
"Seb Coe, Get Out, we know what you're all about! Missiles, job losses, Olympics for the bosses!" I listened to the first few speeches at the rally and then had to leave, although there was expected to be a short and entirely token occupation of one of the nearby Nike sponsored playground, and unfortunately I missed speeches by John McDonnell MP and others. The first speakers at the final rally included Brian Richardson of Defend the Right to Protest, Ruth Tanner of War on Want and Chris Nineham of the Stop The Olympic Missiles Campaign. Nineham declared that the London Olympics had already set a number of records, including the largest ever number of arrests on the first day, the highest ticket prices, the most intensive application of branding rules and the highest level of militarisation of any Olympic games, with far more being spent on security that even in China. There were, he said, more troops in London than at any time since World War 2, and more than at any time in Afghanistan. He made the link that having our soldiers in Afghanistan was what made us a terrorist target and called for the immediate withdrawal of troops as a far more effective security measure than those currently in force. One of the speakers was Melanie Strickland who was among the 182 'Critical Mass' cyclists arrested last night (someone pointed out this was another record for the London Olympics, more arrests than Beijing) after the group of around 4-500 had disobeyed warnings not to enter the games lanes or go near the stadium. She was arrested after she had annoyed police by giving one of those previously arrested, a Muslim skateboarder who had been fasting all day, some water; one of the officers had recognised her as someone who had been present at some Occupy events and decided this was good reason for her arrest. She was one of several speakers who mentioned the Black Power salute at the 1968 Olympics by the African American athletes Tommie Smith and John Carlos. Dr Carlos spoke recently in London and got everyone present to raise their hands and say "I am not afraid to offend my oppressor! ", and the audience at the rally repeated his message. Many years ago you needed a licence to cycle along canal towpaths, and after I'd been told off quite a few times I finally got myself one - I think it cost something like 5 shillings a year. Then the licences became free, and finally were abandoned altogether leaving the towpaths open to all for cycling. Many of them are useful safe cycle routes, and more would be if only the surfaces were more cycle-friendly. In places they are very narrow (often because hedges are not properly trimmed) and often they have deep mud ruts or half-embedded large stones or bricks that are a real hazard to cyclists. Some of the locks too have steps and turns that are almost impossible to negotiate on a bike, even if you are wheeling it; worst are those that have been rebuilt in relatively recent years; those from the old days were designed for horses and generally much easier for bikes. I'd like to see everything being made more cycle-friendly. My two days of riding left me with scratches and scars on legs and arms and a possibly cracked rib - and a week later I'm still in some pain. I didn't take many pictures because it was too painful to ride with a camera strap around my neck as normal. There was of course too much green for my kind of pictures. Sharing a path with people on foot was occasionally a problem too. There are just a few people who refuse to step to one side of the path to allow a cycle to pass them, though they would do so without thinking if a walker was coming in the opposite direction. It's an attitude I can't understand. Others react excessively, hiding in the bushes to the side of the path when you are 50 yard away; less of a problem, but still somehow a little upsetting. But generally people are fine, and sometimes surprise me with their kindness - like the man in Kings Langley who brought me a very welcome pint of lemon squash after I had collapsed from exhaustion on a grassy bank outside his house or the woman who rushed to see if I was OK and help me up one of the several times I fell off my bike. But there were many moments of pleasure too. It was good to get away from London (and the Olympics) for a couple of days, sometimes to ride for several miles without seeing another living person. Unless they upgrade some of the towpaths I wouldn't do the whole journey again, but might put my bike on a train to cut out some of the more familiar parts, perhaps starting from Watford. I've written perhaps a bit more about the journey on >Re:PHOTO shortly after getting home, when I was just not up to going out and taking more pictures. But there are a few more pictures here. 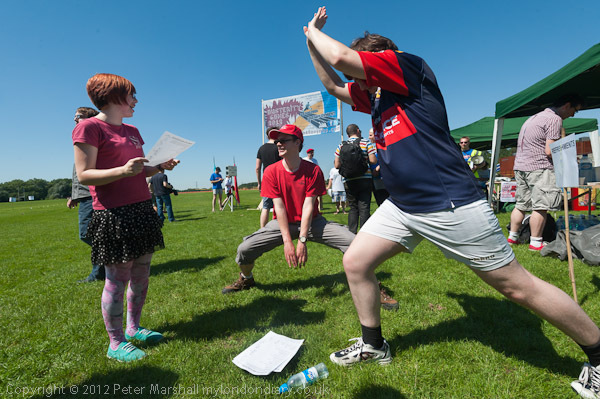 At the 'Austerity Games' on Hackney Marshes, just north of the London Olympic site, trade unionists and youth from across Britain competed in 10 events highlighting the problems the young now face and lanuching the 'A future for the 99%' manifesto. Although the Austerity Games perhaps lacked some of the dedication and technical excellence of the forthcoming major event, they were perhaps more entertaining. There was something highly amusing about the efforts of the hand-picked athletes taking part in the 'Deficit Discus', none of whom appeared ever to have handled the discus in their previous lives. Only the wandering of some spectators into the landing area a mere 250 ft or so away stopped my demonstration of the correct technique, and although I performed in slow motion the necessary movements, those taking part preferred to throw from a static standing position, from which they managed to reach levels of performance suitable for paying the hugely unnecessary bills for Trident, the troops in Afghanistan and even occasionally the huge tax evasion. There was rather more prior art evident in the 'Property High Jump' though few managed to reach the income levels required to rent most property in London, though the banker benefitted in the first round from a ladder to get him over the bar and later from friends in the City who removed the bar for his 'jump' and carefully replaced it after he had walked through. Two of the photographers present (including myself) had earlier in a hors concours preliminary event demonstrated our ability in the Student Debt Weightlifting, but we were only performing at graduate level of around (£)30 kilos, and were put to shame later by several contestants who managed to lift the huge debts required for masters degrees and doctorates, though not all managed to raise these above their heads. Although it was possible at this Olympics to see all of the events without tickets I did miss the standing 'Job Jump' as I was busy watching the discus. Apparently although most of the competitors managed to reach the Workfare distance, and a few managed to gain Apprenticeship level, none of them could make the standing jump far enough to get a job - rather similar to real life for today's young people leaving education. I was surprised to see the starter for the 'Race to the Bottom' bring out a pistol to start the race, and expected to see security men parachuting down from the airshop photographing us from above or one of the two helicopters circling, but surprisingly nothing happened. The couple of police sent to watch over us had parked their vehicle on the field a few hundred yards away but by this time had gone into the changing room complex nearby to have a cup of tea. Hackney Council had closed the place to the public and refused permission for the Austerity Games to take place, asking the police to stop them happening, but the police had apparently told them they could do nothing about it. Apart from the lack of public conveniences this caused, the council action had no effect. There was some discussion about whether the medals for the Race to the Bottom should go to the first or last to finish, and I'm unsure what the final decision on this was. But as with the other events, gold, silver and bronze medals were awarded and the winners applauded as they stood on the podium. Things didn't quite go according to this plan in the 'Toss a Tory (Shotput)' perhaps because there was general agreement that the Tories were the champion tossers, and the banker competing grabbed all three medals. I had to leave before the final Relay and closing speech, and the last event I photographed was the Hardship Hurdles, where the competitors had to surmount the scrapping of EMA, cuts in youth services, £9,000 a year university fees, unaffordable housing and unemployment. Since none of these affected the banker in the race who simply ran straight through all the hurdles, he was, as in life, the inevitable winner. This was a fun event and on a rather smaller scale than the Olympics, costing virtually nothing but providing considerable entertainment for those taking part and watching. Unlike the Olympics which exist in a world of their own, it also drew attention to the serious problems we face, and was also the launch event for the 'Youth Fight for Jobs Manifesto', described as "A Future for the 99%, which lays out the problems faced by young people in Britain today and a strategy of how to get organised and fight for a decent future." 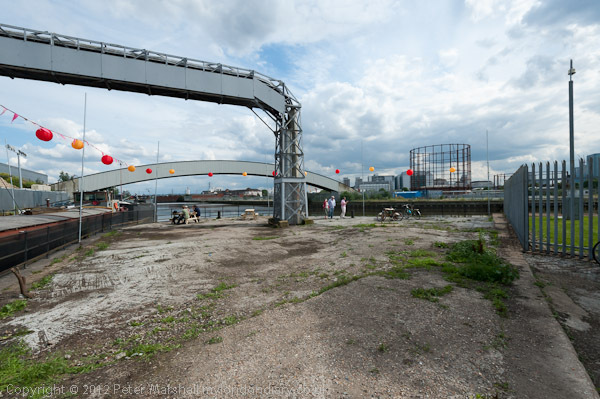 East Londoners protested the closure of the Lea Navigation towpath alongside the Olympic site, a vital cycle route across the area as well as a recreational footpath, marching to the closure site and holidng a picnic there. A vital part of London's Olympic bid was the promise that this would be the greenest Olympics ever, and it is a promise the London games have failed to live up to on every level. They failed to realise the opportunity of the allotments on the site, closing them down; they failed to use the canal system to remove waste and bring in materials; canal transport to the games will be a horrendously expensive largely corporate jolly rather than a genuine water bus service, and while they promoted the idea of people cycling to the games, instead they have closed the two major cycle routes in the area, which were also widely used by walkers. The Greenway, used by many to travel to work as a short and direct route from Hackney Wick to Stratford closed in May, and will at least be used by those attending the games. As it passes between the stadium and the warm up arena, keeping it open as a through route during the actual event would not have been possible, although it is impossible to justify closing it over two months in advance. 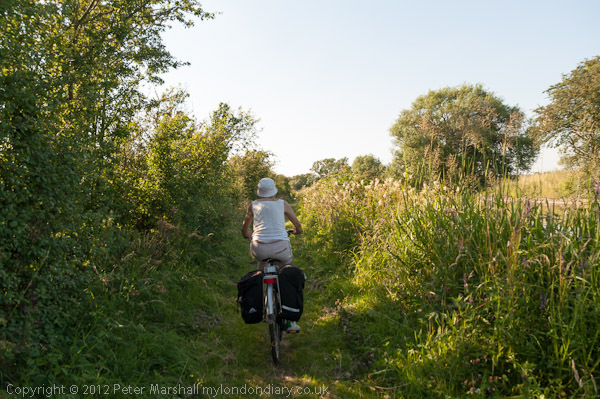 Another key route for cyclists is the Lea Navigation towpath, and there had been an undertaking to keep that open during the games, with a 10 ft high electrified fence having been erected between it and the Olympic site, bristling with security cameras. Ten days ago this too was closed, and it is not expected to be reopened before September 12th. Alternative routes are roughly 50% longer and include cycling on some busy roads, ending at the notorious Bow Flyover roundabout where two cyclists have recently been killed. The 'Open Our Towpath' campaign point out that the Olympic games web site still shows the towpath as a route for cyclists, and say that the closure is illegal, and ask for the path to be returned to public use. Today the held the third weekly protest against the closure, meeting together with member of the Save Leyton Marsh Campaign next to the 'temporary' basketball practice site erected on Leyton Marsh, and walking from their down the towpath to the closure a few yards south of the Eastway Bridge over the navigation. There they set up a barbecue and held a protest picnic, having failed to persuade the security men on duty at the gate to let them through or the two PCSO's present to take action against what they allege is an illegal blockage of the right of way. Although the protest was not a huge one, in the couple of hours I was there, literally hundreds of cyclists on their own or in small groups arrived at the fence, expecting to be able to cycle along the towpath. Some saw the notice and barrier and simply turned away immediately, others stopped to read the notice and some to try asking the security men why the towpath was closed. Many of them expressed their frustration at the closure and others asked for help in finding a route avoiding the closed path. The Lea Navigation is also closed, and the narrow boats normally moored just above here have all been forced to move. The moorings have been made available for the Olympic period at extremely high rents, and there were a few flag bedecked boats moored there as we passed. Just above the Eastway bridge there is a yellow barrier strung across the waterway to block the area to boats, although the water bus service (£95 VIP return, £45 normal return) will apparently make its way past. The protesters as well as a barbecue and large awning had also brought along 3 inflatable padddling pools which they could have used as primitive craft on the canal, but as they began to blow them up a small security boat with two men on board appeared ready to repel any nautical invasion. A police van had come to Leyton Marsh for the start of the protest, and as well as the two PCSOs who stood watching over the picnic for an hour or two, there seemed to be no shortage of security men hanging around this end of the site, with several groups seemingly totally unemployed behind the prison-like wire fence as well as the two on the boat and five behind the flimsy fencing across the towpath. At one point several police also turned up an peered at the picknickers through the fence for a few minutes. I visited Cody Dock in April and wrote Gasworks Dock Revived, which tells something of the history of the dock and the efforts being made to develop it into a real community resource, as well as filling a vital link in the footpath along the bank of Bow Creek from Bow Locks eventually to the Thames (there is still another gap beyond Cody Dock. So when I got an invitation to their public Open Day I was keen to see how the project was getting on. Unfortunately I'd been held up by 'security' in Stratford, and arrived more or less as the open day was ending, passing people going home from it, and with only a few minutes to spare before rushing back to Star Lane DLR to continue my journey. So I only had time to take just a few pictures there, and couldn't stop to talk. Although the BBC has taken over most of the top 5 floors of Lund Point on the Carpenters Estate next to the Olympic park as studios for its coverage of London 2012, there are still some flats occupied by owner occupiers in the block. On a tour with residents group CARP (Carpenters Against Regeneration Plans) I was invited to visit a flat on the 20th floor of this 22 storey block. I had a very limited time to work but managed to make a couple of panoramas as the single images while I was there. BBC security called on police to stop this man, his family and guests going to his flat in Lund Point. Colin, a resident in Lund Point on the Carpenters Estate in Stratford had invited a group viewing the estate in a tour organised by CARP (Carpenters Estate Against Regeneration) to come to his flat to see the high standard of accomodation in the 1966 tower block and the views across the estate. The BBC have rented the vacant areas of the top five floors of the 22 storey block as a base for their Olympic and Paralympic coverage. The group included a number of UK and foreign journalists, photographers and TV crews with an interest in the area. At around 1.15pm we approached thw tower block to find the resident's doorway blocked by two burly security men, employed by the BBC. We stated our intention to visit one of the residents and were refused entry. We then visited a couple of nearby sites before returning around 50 minutes later to find a group of five PCSOs and a police officer assisting the security men in blocking the doorway. We again stated our right to enter and were refused, and when Colin, a resident of the block, tried to enter he was prevented from doing so. The policewoman present told us she was calling for a senior colleage and refused to discuss any reason for not allowing us to enter. 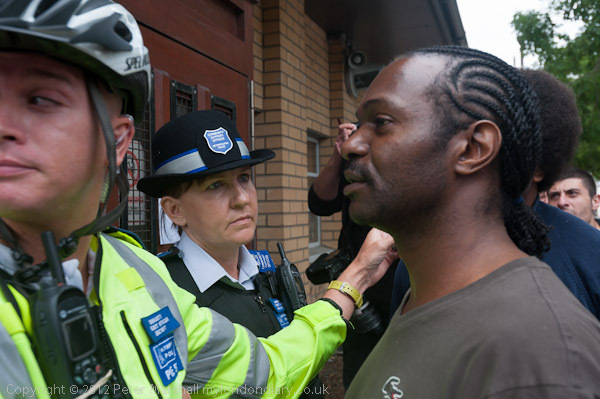 When another officer did arrive, he too refused to discuss the right of residents to enter their homes or to invite friends to do so, but again called for further assistance, with two police vans arriving a few minutes later. Eventually, shortly before 3pm, the police could find no reason to bar us from the building and let us. The reason for the BBC's reluctance to let the press see the inside of the building was soon apparent. Although this is still a residential building with around 30 flats still occupied, the interior appeared to be a health and safety nightmare, with cables, desks in lobby areas and so on. Next we tried to visit another resident who owns a flat on the 20th floor of the block, and again police and security at first told us this was impossible. We took the lift to the 20th floor and were met by the two security men, who at first blocked our way out of the lift, and then stopped us from going down the corridor to the flat. The resident who had extended the invitation to the group confirmed that we were welcome and finally we were allowed through. This was in no way an anti-Olympic event, and CARP has no quarrel with the BBC, although some of the residents had complaints about their activities on the estate. They accuse them of various breaches of the planning agreement for the use of the site and of a contempt for health and safety. The resident's lift is only supposed to be used for people (the BBC have an external site lift for materials) but one told us how he had travelled down with his kids in a lift full of bags of waste material, which he had been appalled to find were dangerous asbestos removed from some of the areas being used by the BBC. Another from the neighbouring terrace pointed out the huge emergency generator behind a fence on the grass where his kids used to play, and suggested it had no planning permission. He also said that when running it was extremely noisy and belched out clouds of black fumes into the neighbouring gardens. Both residents in the block and around also said they had been worken as early as 6am by noisy building work taking place. Newham Council plans to sell off the Carpenters Estate next to the Olympic site to University College London and has been removing residents and boarding up good quality housing for over six years despite the desperate housing shortage in the area. The Carpenters Estate was first developed by the Worshipful Company of Carpenters in the late Victorian era, with a mix of industry and housing. Much of the area was badly damaged by bombing in the Second World War, and the estate was redeveloped by Newham Council in the 1960s. It was in some respects an exemplarly development of the time, with large area of two-story terraced housing, some maisonettes and three 22 storey point blocks. The area also retained some of the small industrial premises and included shops, a pub and a school, and later a community and health centre. It was and remains a popular estate, relatively small with good communal open space and amenities, close to the centre of Stratford and next to its station, though the closure of the direct access to this leaves residents with an unnecessarily long detour. But around ten years ago, Newham Council decided to run down the estate, 'decant' off as many of the residents as it could, and board up (with squat-proof metal shutters) the good empty properties. it was a scandalous decision given the terrible housing shortage in the area, and one that has been extremely unpopular in the area. Even the tower blocks are pretty popular, with good quality accomodation that a number of tenants were happy to exercise the right to buy. In November 2011, the council, upset at the activities of local residents who wanted to remain on the estate decided to fix the elections to the Carpenters Tenant Management Organisation (TMO). They barred freeholders on the estate from standing for the new board of management and 'lost' five out of the six leaseholder nominations. At the AGM the TMO officials employed security guards to refuse entry to all freeholders who had been invited to attend. The election rigging enabled Newham to effectively take over the TMO and to end real participation by tenants and freeholders in the consultations over the future of the estate. The changes have led to a loss of confidence in the eficacy and independence of the TMO commisioned valuation service which was supposed to stand up for the interests of tenants and challenge the low valuations by the Council for Compulsory Purchase Orders. Residents formed Carpenters Against Regeneration Plans (CARP) to challenge what they say are unconstitutional decisions made by the TMO and to get it to fulfil its duties to all residents of the estate, and to fight for the future of the residents and for a sustainable community. CARP also point out that by emptying useable properties on the estate the council is unnecessarily losing income for its housing budget and that this makes no economic sense. They also warn that tenants who take up the offer of alternative accomodation in flats owned by the housing associaton, Genesis Housing, are losing their secure tenancy status and becoming simply hte much less favourable 'assured tenancies'. The tour around the estate, one of a number arranged by CARP, starting from Stratford Station, was led by Tawanda Nyabango who lived for many years in one of the tower blocks, with contributions by a number of other residents, prticularly CARP vice-chairman Joe Alexander. After a long tour of the estate and a brief detour to see the Waterworks River along the west of the estate it tried to enter Lund Point, one of the three tour blocks on the estate to visit two of the flats there. BBC security (they are using some of the top five floors for Olympic coverage) and then police stopped us from entering for around an hour and a half, but finally had to admit us since we had an invitation from the residents of the two flats. The pictures from this aspect of the event are in the separate story, Police Deny Olympic Residents Access. The BBC had at first wanted to use another of the point blocks, James Reilly Point, but determined action by one of the residents there had caused them to change their plans. At Lund Point there are certainly those who feel that the BBC have not been good neighbours in the block, and today's action will have reinforced that opinion. 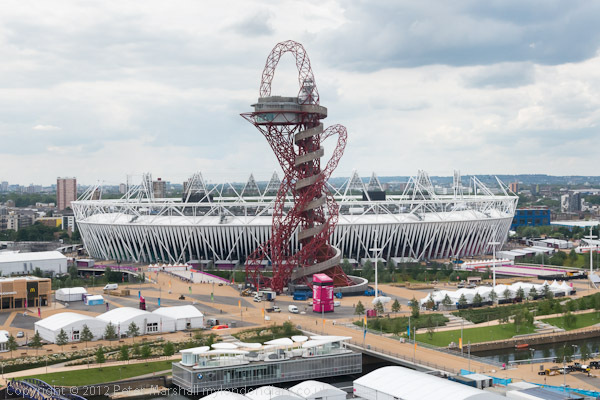 CARP certainly has nothing against the Olympics, and is not against the idea of regenerating the estate, but are against the secretive way that the Mayor and council have acted. They accept that there may be a need for change, but would like an honest and open process in which proper consideration was given to the current residents, whether tenants, leaseholders or freeholders. On the tour were a number of students from University College London (UCL) with whom the council are in discussions over the takeover of the area as a new campus, who at one point held up a banner stting their opposition to the UCL 'land grab'. But clearly this proposal would be in line with current Newham Mayor Robin Wales's ambition for Stratford to become 'London's Third City', even if it would mean getting rid of many of the people who currently live there. The Olympic flame went along Stratford High St this afternoon ignoring the Olympic site visible a few hundred yards to the north where it is not due until next Friday. The Olympic flame on its tour of London passed within spitting distance of the Olympic stadium this afternoon. There were a few people on the street to watch it, and rather more including some organised Olympic groups on the bridge taking the path along the Greenway - which is a on the walkers' well-used Capital Ring - over the busy road. The footbridge here would be a genuinely useful legacy of the games for walkers were it to be left in place, carrying the path on the Northern Outfall Sewer across the busy dual carriageway. At present the path, a major route for people on foot or bicycle between Hackney Wick, Stratford and beyond, is closed through the Olympic area, but will reopen some time after the games. But at Stratford High St there is an annoying detour to cross the road (which has a central fence) at a pedestrian crossing, which the bridge avoids. Unfortunately it is planned to demolish it after the games. The torch relay stopped opposite Warton Road, which leads directly to the Olympic site, less than a quarter mile away, and the flame was passed by one runner to the next who ran with it away from the games site. Latin American groups protested at the Colombian embassy against the mistreatment of indigenous Nasa people by the Colombian military in the war against the FARC, calling for the removal of military installations and personnel from their region. Around 50 people arrived for the protest, including a group of Peruvians who had been protesting earlier opposite their own embassy. They held a spirited protest with the usual chanting of slogans and short speeches (mainly in Spanish) but enlivened both by the traditional dress worn by some of those taking part and a great deal of live music and dancing. We have called for an urgent manifestation outside the embassy today because we are extremely worried about the way the Nasa people in Cauca are being brutalised by the Colombian military. We are here to show you that the world is watching what happens in those isolated areas of conflict , and that the Nasa people who historically are the real keepers of that land deserve to be treated with respect, something that the state has failed to do so far. As you are aware, the indigenous people and the peasants have been in teh middle of the conflict between the FARC, paramilitaries and the national armed forces. They have repeatedly refused to take part in this civil war that has lasted so many years . Thouth they reuse to take part in the war, they have offered solutions that have been ignored againn and again by all parties. The Nasa people have lost children, elders, women and men in the war that they have not participated in. They are true victims here, but the stae and the media shows them as terrorists and savages. For 500 years the indigenous people have been on the receiving end of opporession, teuy have been assassinated, raped, rtorturee, robbed and displaced from their lands and still they have managed to escape complete annihilation. The Nasa people are sacred to our country, they are the original people of that land and therefore have the right to choose the destingy of their teritory without the interference of outsiders. We ask that you contact the government and let them know tha Colombian migrants in the UK and our British supporters ask that the state removes all military installations and all military personnel from that particular region, in respect to the wishes of the Nasa people. The protest was also in support of the people of Cajamarca, Ibague and Tolima who are resisting the takeover of their territory by Anglo Gold Ashanti, the indigenous and Afro-Colombian communities displaced by El Cerrejon coal mine and in solidarity with "all the trade unionists, human rights defenders, students, working class and all oppressed people who continue the onslaught in Colombia." 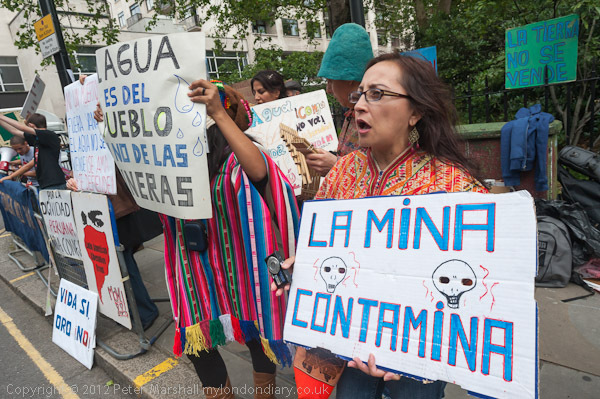 Peruvians led the protest at their London embassy against the Minas Conga gold mining project which has prompted anti-mining protests in Cajamarca brutally repressed by government with five protesters reported killed. The people in Peru fear that the $4.8 billion Minas Conga gold mining project by US Newmont Mining Co will drain mountain lakes that supply their water and replace them with large reservoirs of toxic waste. Although the project has been supported by the national government, the provincial authorities still oppose it. The government have imposed a state of emergency following protests and the deaths and police violently arrested Maro Arana, a prominent anti-mining activist and former Catholic priest in the main square of Cajamarca. Around 50 protesters, some wearing traditional Peruvian costumes, protested noisily opposite the Peruvian embassy in Sloane St for several hours. Most of the slogans on the placards and banners were in Spanish, with just a few in English. A letter to the embassy was read out in Spanish, but there were a few announcements in English. As the protest continued, more musicians arrived with pan flutes, drums and guitars, and many of the people started dancing and clapping. 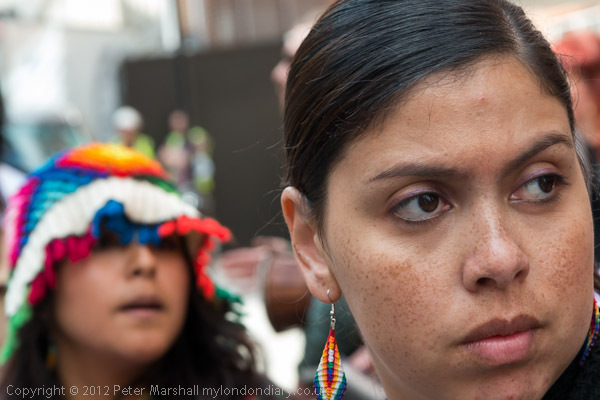 As well as Peruvians there were also protesters from other South American countries and South and Latin America support groups in the UK. The protest ended shortly before 4pm, with some of those present, including myself, going on to a protest against the brutal repression of the Nasa people in Colombia. Cleaners held their second one-day strike at John Lewis's flagship store in Oxford St, picketing from 6 am and holding a lunchtime rally. They want to end their treatment as second-class workers to be paid a living wage and no reductions in hours. The cleaners who work unsocial hours, often starting in the early morning and finishing late at night, are paid the minimum wage of £6.08 an hour. This is over two pounds an hour less than the London Living wage, an amount calculated by the Greater London authority to be £8.30 per hour. Both Mayor Boris Johnson and Prime Minister David Cameron support the idea of a living wage, and urge employers to pay it. 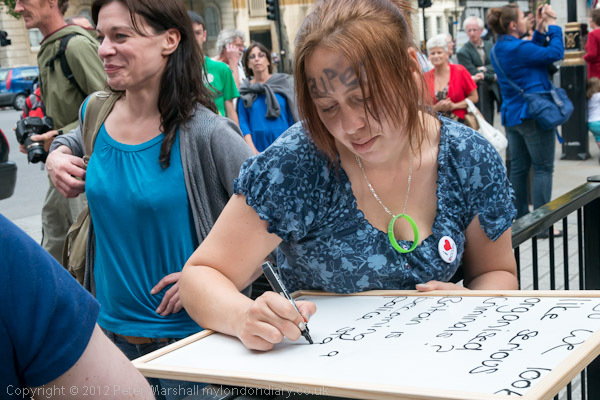 Talks have gone on between the John Lewis Partnership and bodies representing the cleaners including the the London Citizens campaign for some years, urging the partnership to treat the cleaners as it does the other workers in the store, who are all 'partners' and share in the company's profits, but they have made no headway. John Lewis has avoided its responsibilities towards the cleaners by employing them through a contract cleaning company, Integrated Cleaning Management (ICM), which the cleaners say treats them as dirt, as "bacteria" and who pays them the minimum wage and is currently proposing to cut the number of hours they pay for the cleaning work by around half while expecting the same work to be completed. 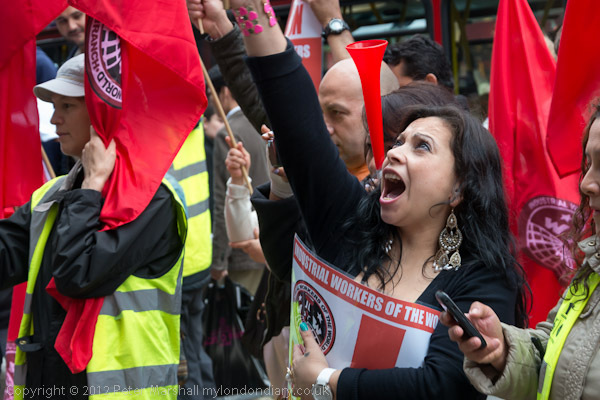 The cleaners are now members of the London Cleaners' Branch of the IWW, which has tried to negotiate with ICM and to talk to the John Lewis Partnership. Unable to make any progress, they called a series of demonstrations outside the Oxford St store, then balloted the members to hold a series of strikes. As in the previous protests this was a colourful and noisy event attracting a great deal of attention in London's busiest shopping street at lunchtime. Many of those passing were shocked to learn how little the cleaners were paid, and some contributed to the strike fund. The rally continued despite some heavy showers. Police stood on guard outside the store to prevent the protesters entering it as they did peacefully for a short period last week. Further protests are planned every Friday and Saturday until a satisfactory settlement is reached, as well as more one-day strikes. What the Dickens Mr Cameron? A small group came to Downing St to ask David Cameron if he wants to return to the days of Dickens and Oliver Twist with the cuts in benefits, particularly for the disabled. Police told them they would be arrested if they continued to protest there. Several of those involved in the protest had earlier in the afternooon been with a group of disabled activists who had lobbied MPs and then briefly staged a bread and water 'Paupers' Picnic' in the Central Lobby of the Houses of Parliament, where unfortunately cameras are not allowed. "david cameron has clearly declared war on the poor. is this man attempting to plunge is back into the days of dickens and oliver twist?? grab ya rags and ya begging bowls as we go to downing street to ask the prime minister what the dickens is going on? " In the event there were no rags and no begging bowls and the protest was rather small and low-key. Shortly after I arrived a woman police came and told the protesters that it was against the law to protest directly outside the gates of Downing St and that if they wanted to continue they should go across the road to the area provided for protests. The protesters made the point that they would not be seen or heard if they protested across the road and asked what law made the protest illegal. SOCPA was widely criticised at the time for its attack on civil rights, and in the last years of the Labour government there was a consultation over removing the powers which restricted the citizen's right to protest, which had been added to the bill in an unsuccesful attempt to end the protest in Parliament Square by Brian Haw. Although most of the powers to restrict protest from it are no longer in use, some have now been replaced by more draconian measures which have allowed police to remove all tents and other forms of shelter used by protesters in Parliament Square, despite which Brian Haw's protest, continue after his death last year by Barbara Tucker and others, is still continuing. The protesters were then informed by the officer that if they continued to protest they would be arrested. After a brief discussion, a final message was written on the whiteboard, 'Fascists! can't protect you Dave! ', and after a minute or two calling the police 'fascists' the protesters dispersed. London taxidrivers 'mass ply for hire' halted traffic around Parliament Square for over an hour in the first of 3 protests at taxis not being allowed to drive, pick up or set down passengers in 60 miles of Olympic lanes in London. Hundreds if not thousands of London's 'iconic' taxis came to central London today and took part in a 'Mass Ply for Hire' demonstration where with 'For Hire' lights on they drove slowly down Whitehall and around Parliament Square, soon creating gridlock which brought traffic through Westminster to a half for around an hour. TfL estimates of numbers given to the press seem obviously low and intended to play down the protest, organised by the United Cabbies Group (UCG) but also supported by some other London taxi organisations including the RMT London Taxi branch against the widespread banning of taxis from driving in the Olympic lanes in London. Except in a few stretches, taxis cannot even go into them to pick up or set down passengers. Most of the bus lanes in central London are being turned into 'Zil' lanes and taxis are banned - and face a £130 fine if they enter them. Cabbies are particularly annoyed as the London black cabs featured strongly in the bid for the Olympics, but they feel they are now being left out in the cold, with the restrictions making it impossible for them to earn their living for a couple of months. Consultations between road users and the games organisers have led to some relaxation of the overall restrictions which would have kept the games lanes operational for the entire period and made some journeys virtually impossible because right turns across the lanes are banned. During the actual periods of the games and paralympic games, they feel the restrictions will remain an almost insurmountable obstacle to taxi movements across London. The increased journey times - in some cases expected to be several times as long, with a similar increase in fares - and the inability to set passengers down or pick them up where they want to go will particularly impact on disabled users, many of whom are reliant on taxis for mobility. There are 44 nearside games lanes and taxis will only be permitted to access 2 of these. The UCG balloted their members after exhaustive negotiations with the organisers had gained only minor improvements, and 87.4% were in favour of immediate demonstrations. Today's event was the first of these and appears to have been extremely succesful. Two further similar protests in as yet unnamed venues have been announced, for Monday 23 July and Friday 27 July. Some other organisations of London cab drivers, including Unite, the LTDA and LCDC have apparently been satisfied by the concessions obtained from LOCOG, the ODA and TfL. The organisers want to keep the protests legal and to maintain good relations with the police. There was an unfortunate incident at a previous taxi driver's protest - the first organised by the UCG several years ago - when a driver was dragged out of his cab by an officer, thrown to the ground and handcuffed with his wrist being broken in the process after he had objected to being abused by an irate motorist. So far as I could see there were no such problems on today's protest. The procession of Our Lady of Mount Carmel, the first Roman Catholic event on English streets for 349 years when Queen Victoria allowed it in 1883, took place in Clerkenwell today, 149 years after the founding of St Peter's church there. The procession required special permission from the police, granted by Queen Victoria in 1883, when the Clerkenwell area in which St Peter's Church is was known as 'Little Italy', home to many refugees and immigrants from Italy. They needed a Catholic Church in which they could worship in their own language, and on the 16 April 1863, St Peter's Italian Church was consecrated. The annual festival is one of London's oldest and most colourful religious festivals, with the various statues from the church being carried around the local area and the clergy and congregation following behind them. Nowadays Italians have moved out to many other areas of the country, and groups from Italian associations across the South East as well as Manchester, Cheltenham, Birmingham, Peterborough and Gloucester come back to join in the procession. This year the special guest at the proceedings was the Apostolic Nuncio Archbishop Antonio Mennini. 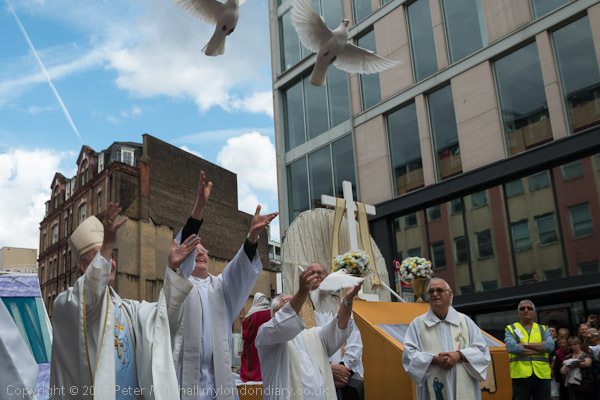 One of the special features of the procession is the release of three white doves by the clergy at the start and finish of the event. This year the doves at the start made their way skywards at a great rate and only one of my photographs caught a couple of them in flight. By the time the procession came back down the Farringdon Road towards the church I was already in a local pub and I missed it. Later I went back to the festival or Sagra which had started around lunchtime in Warner St at the bottom of the hill below the church, with stalls selling Italian food and drink - pizza, bread, wine, ice cream and more - and various cultural artifacts as well as music and dancing. It's a good place to meet old friends, and there was a great deal of conversation in Italian. By the time I finally left the dancing was really getting into swing and everyone was having a good time. Around a hundred cleaners and supporters protested noisily for two hours at the Oxford St store calling for recognition of their work as partners in the company and the London living wage, watched by many shoppers, police and John Lewis management. Today's protest came after the one-day strike by the cleaners yesterday, which was follwed by a rally and a brief invasion of the store. Police arrive in rather larger numbers a few minutes after the protest started and small groups were stationed at the various shop entrances. Around a hundred people turned up, despite the poor weather. Severe congestion in central London and the closure of the Victoria line meant that many (including myself) took longer than expected to get to John Lewis's flagship store in Oxford St, and the protest started a little later than planned, and others were still arriving an hour or so after in began. A number of men including one the cleaners identified as one of the John Lewis's senior management watched the protest from a few yards back inside the store; he turned away when he saw my camera pointing at him through a door as customers walked out, but not before I had photographed him. Despite talks that have dragged on for some years, John Lewis still refuses to accept that it should treat its cleaners with the same decency as its other workers. Instead it uses another company, Integrated Cleaning Management (ICM) to employ them under inferior conditions and on the minimum wage, more than two pounds an hour below the London living wage, a figure representing the minimum needed to live in London, backed by the GLA, London's Mayor Boris Johnson and our prime minister, David Cameron. The cleaners also complain about discrimination and abuse at work, and are currently threatened by a 50% cut in their hours. They are staging another strike next Friday when they also intend to protest again and will also continue to protest each Saturday afternoon. 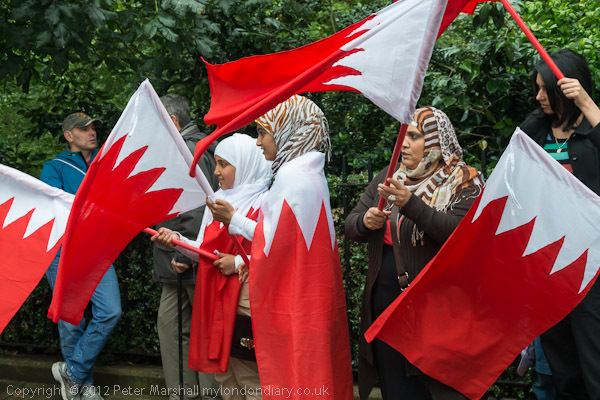 Protesters gathered opposite the Bahraini embassy to call for the release of prisoners in Bahrain, to condemn the killing of Mohammad Rahdi Mahfoodh and attacks on his funeral, and for an end to the puppet regime of the Bedouin Al Khalifa tribe. Unfortunately I had to leave for the cleaners' protest in Oxford St before things really got going and before the speeches from Jeremy Corbyn MP and others. 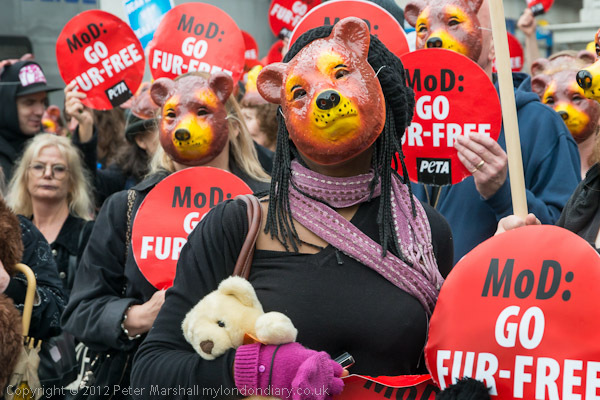 Around 500 PETA supporters in black with bear masks carrying teddy bears marched from Waterloo to Marble Arch demanding a stop to killing of bears for the Queen's Guards' ceremonial headwear. It takes the skin of a whole black bear to make a busby. It can take the entire hide of one Canadian black bear to make just one cap. Bears can be shot several times before they die, and some escape and bleed to death. In some Canadian provinces, there are no restrictions on the shooting of mothers who have nursing cubs, leading to the slaughter of entire families during hunts. We need to send a clear message to the Ministry of Defence that the slaughter of wildlife for The Queen's Guards' ceremonial headwear is unacceptable and that the time has come for them to go fake for the bears' sake. I went to the starting point of the march next to the Shell Centre at Waterloo, but it was then raining steadily and I could see nothing worth photographing, so decided to meet them again at the end of the march at Marble Arch, where they arrived half an hour later than I expected, but at least the rain had more or less stopped by then. Harringey Private Tenants Action Group protested at letting agents Drivers & Norris on Holloway Road, condemning them for taking over £300 from home seekers and providing nothing return but refusing to return the payment. 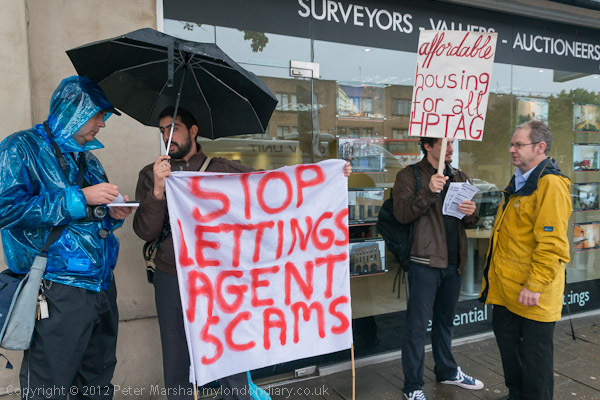 On a rainy Saturday morning a dozen or so members of HPTAG stood outside estate agents Drivers & Norris on Holloway Road with banners and placards calling for an end to scams by letting agents. Some of those present had applied to them and had been asked to pay an upfront fee of over £300 cash to secure a new flat. Although the company had failed to provide them with any offers of accomodation they had refused to return the fee. Agency 'fees', reference 'checks', admin 'fees', leaving 'fees' are all costs that have been created over the past few years by and for Letting Agents like Drivers and Norris, to increase their profits and exploit the basic nee of tenants to find a home. We, as private tenants, will not accept this anymore. We have a right to really affordable, secure and decent housing just like anyone else. HPTAG's investigations show that the cost of the reference checks that the company use to justify these large upfront fees are around £19. The fees are simply a scam to increase the company profits at the expense of poor and vulnerable people in need of housing. A police van with a handful of police came to the scene of this entirely peaceful protest. Officers tried to persuade the protest to stop on the basis that it might cause accidents by distracting drivers on the busy main road. The protesters told them that they had a right to protest and that if the police seriously thought there was a danger to traffic they should divert it away from the area. It was simply a clumsy attempt by the police to suppress lawful protest. Agents have profited greatly from the lack of affordable housing in the London area, with property prices well above anything that anyone on an average wage can afford. Coupled with a systematic attack by successive governments on the security of private tenants and on the provision of social housing over more than 30 years this has resulted in a dire shortage of housing for ordinary people in London and the south-east. Even where housing developments are taking place in London, the properties are often many bought by overseas investers interested in high profits in an overheated housing market. 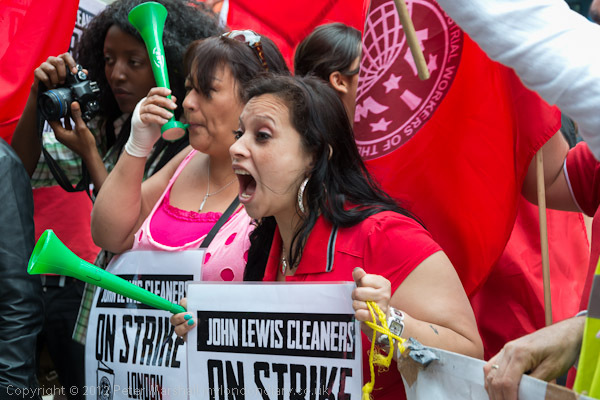 Cleaners today went on strike at the flagship John Lewis store on Oxford St, the first strike in the history of the John Lewis Partnership. Ironically it was the last strike at the company in 1920 that led to the reorganisation of the company as a partnership, while one of the issues at stake in the current dispute is the refusal of the company to accept its cleaners, vital for the running of the store as partners. Cleaners picketed outside from 5.30am, and were joined by supporters including branch representatives and other trade unionists from the PCS, UCU, Unite and RMT for a rally in solidarity at lunchtime. The John Lewis cleaners have wide-ranging support, and so far 21 MPs, mainly Labour, have signed a Parliamentary Early Day Motion 301 put forward by John McDonnell in support of their claims. The cleaners have also received support from some of the partners who work in the store who wonder why the cleaners, whose work is essential for the running of the store, have not been brought into the partnership. 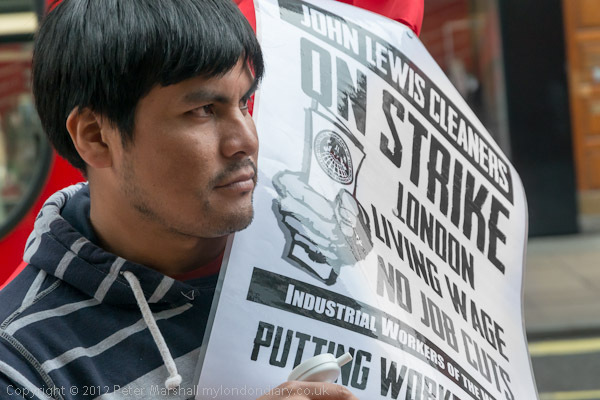 The strike followed the failure of talks that have gone on some years without progress between the London Citizens campaign and John Lewis to bring the cleaners into the partnership and to pay them the London Living Wage, currently £8.30ph. Currently they are paid on the minimum wage, and the strike was precipitated when Integrated Cleaning Management (ICM), the company who employ them on behalf of John Lewis, announced there would be a 50% cut in jobs and hours to clean the store, and refused to pay the living wage. ICM also refuse to recognise the IWW, officially recognised as a trade union in the UK in 2006, for collective bargaining, although almost all the cleaners now belong to it. Today's strike was supported by 90% of the cleaners in a ballot with an 80% turnout, and the IWW has made it clear that further strikes will follow in July and August unless ICM are prepared to meet their demands. "John Lewis needs to take responsibility for those who work in their store and stop behaving like Pontius Pilate washing their hands of the situation. We have had an overwhelming call from our members for action. It is unfair to expect cleaners at the flagship store to accept less staff, more work and live on even less than the poverty wages they currently earn. This is not a model for the economy it is a moral outrage"
The rally outside the main entrance of John Lewis on Oxford St heard speeches of support from a number of trade unionists, including Steve Hedley of the London Region RMT as well as IWW cleaners' branch secretary Alberto Durango. After the rally on the pavement had been going for around 40 minutes, a group of the supporters walked into the John Lewis store and held a short rally in the entrance. A few John Lewis employees tried to remonstrate with them briefly as they walked in with posters and IWW flags, but then withdrew to stand in a line between the protesters and the rest of the shop. After around 5 minutes a PCSO arrived and talked to them. Several of the protesters spoke on megaphones inside the store, telling the shop workers and customers, many of whom clustered around the balconies above, why the cleaners were striking and calling on John Lewis to pay its cleaners a decent wage and give them proper working rights and conditions. A few minutes later the protesters made their way out of the store, to be greeted by cheers from the picketing cleaners who had stayed outside on the pavement. Around ten minutes later a few police officers arrived. One of them had a brief word with IWW regional secretary Chris Ford, and three officers then formed a line in front of the doorway into the store. The rally by now was coming to an end, and Durango thanked everyone for coming and giving their support, and the striking cleaners for their action, reminding us all that there would be another protest outside the store tommorrow, and that the cleaners would be back again striking and protesting until they were fairly treated. The London Living Wage was established by the Greater London Authority and is reviewed by them annually. It was supported by all the major candidates in the mayoral election with Boris Johnson promising he would more than double the number of companies paying it during his term of office. David Cameron has called the living wage "an idea whose time has come." At £8.30 an hour it is still a low rate of pay, with small flats in the cheaper areas of London now costing well over £1000 per month. ICM is part of the Compass Group, and the IWW point out this had pre-tax profits £581 million in the last year and paid its chairman Sir Roy Gardner £477,000 pa. They also state that Gardner is a major donor to Conservative Party funds, and gave £50,000 to Cameron's election campaign. David Loman an 18 year old Jewish lad from the East End who went to fight in Spain in 1936 unveiled a new plaque to the International Brigades at the 76th anniversary commemoration in Jubilee Gardens on the South Bank. 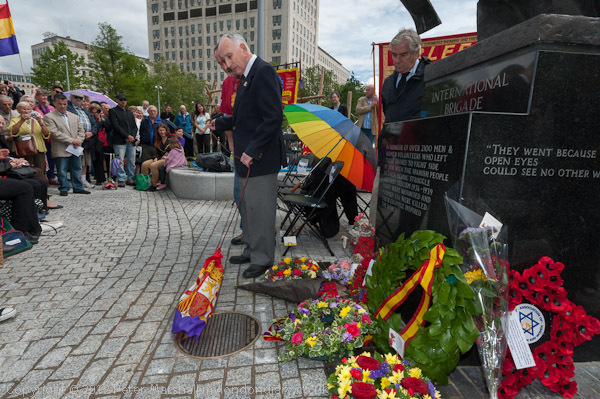 There was music, speeches and wreath-laying at the annual International Brigades Commemoration at Jubilee Gardens today, 76 years after the start of the Spanish Civil War in 1936, attended by several hundred people including many whose relatives fought in Spain. Among the performers were folk musician Ewan McLennan, performance poet Francesca Beard, singer-songwriter Paco Marin and folk duo Na-Mara, but the star of the occasion was David Loman, born in 1918 and a member of the Jewish ex-servicemens association AJEX. In 1936, David Soloman, then 18 years old, volunteered to fight in the British Batallion on the side of the Republican Spanish government against the Nationalists under General Franco. Because it was illegal under the Foreign Enlistment Act, he changed his name to David Loman (or Lomon.) He was captured by Italian soldiers during the 1938 Republican retreat and spent some months in a prison camp before being repatriated. Later he served during theh Second World War in the Royal Navy. Along with other surviving members of the International Brigades he was awarded Spanish nationality in 2007 for his services to the Spanish nation and presented with a Spanish passport in 2011. Lomon at a sprightly 94 is one of only two remaining British veterans of the war, along with Lou Kenton who is now 103. Altogether there are thought to be 18 still living around the world who fought on the Republican side and nine from the Nationalist forces. At the event he laid a wreath at the International Brigades memorial and later pulled aside a cloth to reveal the new plaque presented by the International Brigades Memorial Trust with its text explaining and commemmorating the International Brigade volunteers. This year's 25th Pride in London on foot without the many floats of recent years was perhaps because of this a more impressive, lively and intimate event as many thousands walked, strutted and danced through the West End. Financial problems meant that this years Pride Parade in London was replaced by a procession without the lorries and floats of recent years. To hold a parade, Pride London was for the first time this year asked in late June to supply financial assurances ahead of the event to agencies including the GLA, Met Police, Westminster Council, London Fire Brigade and Transport for London. They were unable to do so, and so that the event could go ahead, instead decided to stage a ‘peaceful protest’ march or 'procession' specified as a democratic right under the Public Order Act 1986. According to the organisers this meant that they were unable to include any vehicles in the event, although traditionally many processions have included these, and it is not at all clear that the Public Order Act gives the police power to impose such a condition on a procession or under what power the Mayor imposed this restriction. Until perhaps a dozen or fifteen years ago, the annual Pride event in London was a procession through the capital in which many came out to 'come out'. 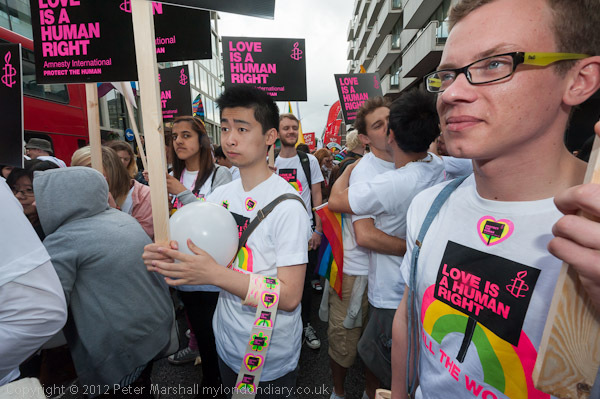 For many taking part was a significant step in affirming themselves as gay and standing together against the predjudices of a society which was only just beginning to accept that being gay was not a perversion. Although this remains the case for a few communities in this country, and as some of those taking part including campaigner Peter Tatchell remind us, people in some other countries are still being killed for being gay, things in general in the UK are very different, and Gay Pride has lost much of its political edge, becoming a carnival of different lifestyles and a commercially sponsored jamboree, with large and expensive floats. For many of us the lack of these in today's procession made the whole event more intimate, with everyone getting down on the street together. There were several heavy showers as people were supposed to be gathering for the event, and although the organisers had insisted that everyone arrive by 10am, an hour before the procession was due to start, relatively few took them at all seriously, and at 10.30am it was looking as if it might be a washout. But at the start time approached, more and more people flooded in to join it in Portman St, and they kept on arriving for the next hour. I'd photographed the front of the march, a few yards from Oxford St, a few minutes before it was due to start, before walking slowly through the at times tightly packed street to Baker St, where people were still arriving to join the end of the procession, just a short distance down the road, almost an hour later, and others were still sitting at cafe tables having a coffee before they started. The end of the procession was still arriving at Trafalgar Square when I decided I'd been standing on my feet taking pictures for too long and left around 2.45pm. It had been raining most of the week and the ground was pretty wet, but at least the mud was fairly sandy and didn't stick much on our boots. We parked by the common and walked down the track past the pub then on a couple of miles to have coffee at Hughenden Manor, coming back by a slightly shorter route. 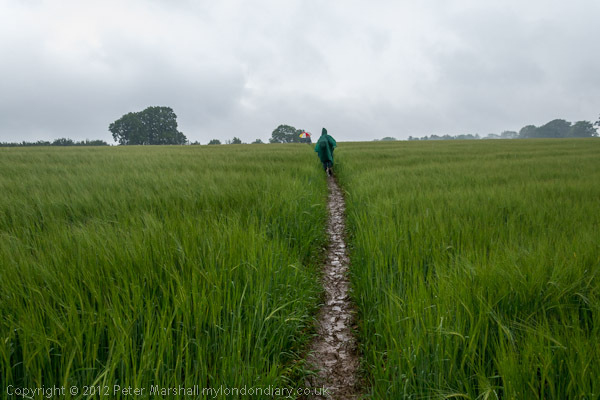 There are some fine woods to walk through, and the Le De Spencer Arms is a friendly pub with decent home cooked food, better for not trying to be fancy, and some good beers. Fortunately I wasn't driving. I was up in London to do a few errands and see a few show, and of course I took a camera with me, and spent a few minutes wandering around a few areas of London I was visiting. From Old Street I took a bus a few stops towards the Barbican, then the Metropolitan line took me to Kings Cross and I walked on to King's Place. Frome there I went to visit the former Kings Cross goods yard, now reopened in part as a university campus, and then walked on by the canal to the old St Pancras churchyard, where I again photographed both the Soane tomb and the Hardy tree, though not as well as I did years ago in black and white. 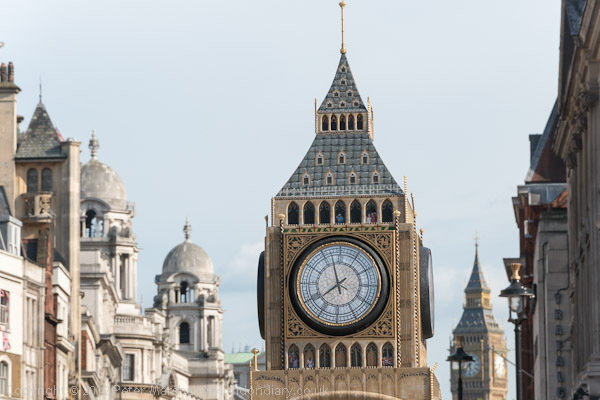 The tube took me to Charing Cross and just at the south of Trafalgar Square we now have a small and not too accurate model of Big Ben, presumably for tourists who can't be bothered to walk down Whitehall for the real thing. Two groups of pensioners held protests in Westminster today, the National Federation of Occupational Pensioners (NFOP) at the Dept of Health and the Equitable Members Action Group (EMAG) outside Parliament. The National Federation of Occupational Pensioners is campaigning for reform to funding social care following the cross party consensus in favour of the Dilnot Report. They are concerned that the government is delaying the publication of the Social Care White paper and delivered a petition with almost 15,000 signatures to Paul Burstow, the Care Minister at the Department of Health in Whitehall. The NFOP, founded in 1930, is the oldest and largest occupational pensioner organisation in the UK with around 18 branches. 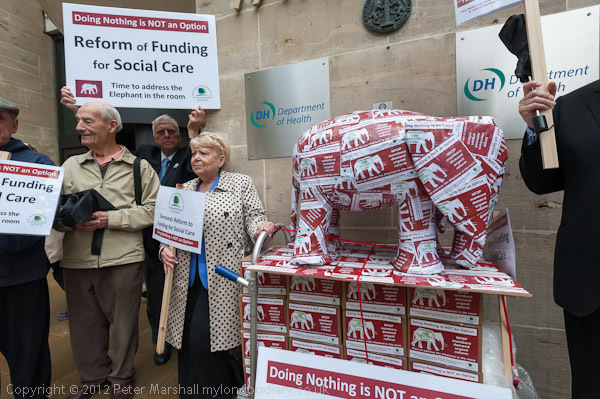 Their 'Funding for Social Care' campaign aims to tell the Government that it is time to address the Elephant in the room that is social care funding, and they had brought a paper elephant covered with their petition postcards along with a stack of boxes containing the signed petition cards with them to Richmond House. The campaign's slogan is 'Doing Nothing is NOT an Option', and they point out that at least 20,000 of the elderly are forced to sell their homes each year to pay for care costs, with pensioners being impoverished simply for being ill. The whole story is a sorry one, with the Parliamentary Ombudsman finding the Labour government guilty of wholesale maladministration, and while the coalition has come forward with compensation, although those holding annuities will get full payment, other policy holders will only receive 22.4% of the amount lost (or, according to EMAG, that percentage of a rather smaller figure than their losses.) Even worse, 10,000 of the oldest pensioners will get nothing at all. 30,000 have died since the collapse without receiving anything, and for those who now will get something it will be spread over as long as 5 years. EMAG is continuing its fight to get a fairer settlement for all of the pensioners and policy holders who have lost out. 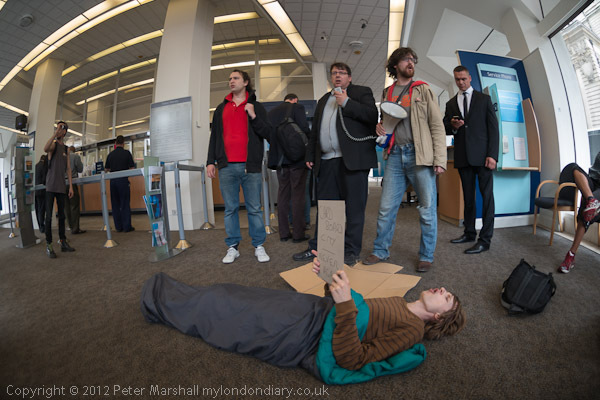 As Westminster waited for Bob Diamond, 'Right to Work' occupied the nearby Barclays in protest. Earlier they had protested at Downing St against David Cameron's 'insane and vindictive' proposals on housing benefit and other cuts. The group of around 20 protesters gathered with sleeping bags, cardboard boxes and banners opposite Downing St, where there were a few short speeches of protest at Tory plans to cut housing benefits, including all those to under 25s, which will make many homeless. They then moved across the road to the fortress-like gates of Downing St, guarded by armed police and staged a protest outside these gates, with one protester getting out his sleeping bag and getting inside it on the pavement, holding up a notice reading 'Cardboard City - Never Again'. A police officer asked them to move away as protests are not allowed here, but was ignored, as the protest went on with several short speeches. A few minutes later more police turned up and one tried to find out 'who was in charge', but of course nobody was. A few minutes later, having been informed yet again that they could not protest in this place, although police indicated they could continue on the other side of the road, the protesters decided that they had made there point and would move on, rather than risk arrest. The group crossed the road and continued with their banner, placards and cardboard boxes down Whitehall towards Parliament Square. Here they paused briefly in front of the vehicle entrance to the House of Commons before being moved on by police as a car made its way in. The pavement here was crowded with tourists as well as some pension protesters and didn't seem a good place to continue the protest, so they moved on past Westminster Abbey and out of Parliament Square to Victoria St. Here on the corner is the Westminster Branch of Barclay's Bank, and they came here because Barclay's former boss, Bob Diamond, was expected shortly in Westminster to testify at a House of Commons committee about his bank's lying over interest rates - something that made millions if not billions for the bank and huge bonuses for individuals working for it. At the bank around half of the protesters walked in the main doors and began another protest there, again with the same man getting onto the floor in his sleeping bag while others made short speeches about why they were protesting. It was an entirely orderly and peaceful protest, although the protesters ignored the efforts of the security guard to prevent them. Using the megaphone they made clear that it was not a protest directed at the staff of this branch, but against those at the top of the bank - including Bob Diamond - who had profited immodestly from the banking crisis and their lies while the rest of us had now to suffer for their crimes. At one point the security man tried to turn off the megaphone, but his hand was pushed firmly but carefully away. After a few minutes, when the protesters felt they had made their point (and we had taken our photographs) they left the bank of their own accord, continuing the protest on the pavement outside with those who had remained outside with the banner. The branch is only a couple of minutes walk from New Scotland Yard, and several bank staff appeared to be making frantic phone calls during the occupation and we had passed many police on our way to the bank, but none had appeared by the time I decided to leave for home around 15 minutes later. Either the bank had decided Barclays was already in the news enough and not to call the police or the police had decided they didn't want anything to do with Barclays today. The protest was organised by the Right To Work campaign which was set up to oppose the cuts, "defend public services and the welfare state and fight for every job." Like many others they feel that those who had least part in causing the economic crisis are being asked to take far more than a fair share in getting us out of it. The poor - low paid, unemployed, students, pensioners and those who depend on the NHS and public services - are suffering, while bankers still get obscene salaries (and severance payments) and the rich are still allowed to evade or avoid billions in taxes. Right To Work is backed by many affiliated unions and union branches and anti-cuts and other campaigning groups. On 25 June, David Cameron gave a chilling view of the cuts to the welfare system that a future Tory government would bring in, suggesting that almost all under-25s would lose housing benefit and that couples with three or more children would be penalised under the benefits system. Single lone parents with more than one child would also be targeted for cuts. Although the harsher excesses of Tory benefit cuts will have to be delayed until the party is in power on its own, as they are unacceptable to their Lib Dem coalition partners, we have already seen some drastic cuts from the coalition with the imposition of an unrealistic cap on housing benefit for those under 35 renting from a private landlord, which at least in high cost areas such as Greater London will make many homeless. It will not only hit the unemployed - the great majority on housing benefit are working in low paid jobs. It is hard to see how London will keep working if a great mass of the low waged who perform essential jobs are no longer able to afford to live in London. Already many face long bus journeys to and from work from the cheaper areas around the capital. The protesters see these proposals as clear evidence of how out of touch Cameron and the other wealthy cabinet members are with the problems faced by ordinary people, with millions living in poverty or on the edge of poverty and likely to be pushed into it by the benefit reforms. For various reasons, including the 'right to buy' but also the bias of central government against local government over the past 35 years, there has been little or no building of the low cost social housing that we need. Although some building schemes now include an element of 'affordable' housing, this is now priced at a level that puts in out of reach for those on lower pay - and it will be above the level allowed by housing benefit. Cuts also affect some groups dispropotionately, and will hit hardest on the disabled who rely heavily on the services which are likely to suffer. The disabled are also suffering from badly designed and poorly administered tests which are supposed to assess their ability to work, but seem largely to be aimed at reducing the number who can claim benefits and the amount of benefits people receive. Already the tests have led to a number of suicides as well as a greatly reduced quality of life for many disabled; perversely the reduction in support for some has meant that they are now unable to work. Safety campaigners demanded that Minister for Employment Chris Grayling should strengthen rather than scrap safety regulations on tower cranes and other aspects of work. Deaths at work increased by 16% in the first year of the current government. Around 50 people came to protest outside the Dept of Work and Pensions (DWP) in Westminster including supporters of FACK (Families Against Corporate Killers), Battersea Crane Disaster Action group and Construction Safety Campaign to demand that the Tower Crane Regulations which came into force in 2010 as a result of their campaigns following a number of deaths from tower crane accidents, including the Battersea Crane collapse of 2006 in which two men, crane operator Jonathan Cloke, 34, and passer-by Michael Alexa, 23, were killed after the company operating the crane erected it wrongly are not scrapped. The event came the day before the end of a consultation period on the Government's plans under Minister for Employment Chris Grayling to drastically cut the rules and enforcement of safety at work. The government intends to scrap 14 sets of regulations on safety at work including the Notification of Tower Cranes Regulations, Construction Head Protection Regulations and the Dock Regulations. They have also are drastically reduced Health and Safety enforcement, banning most proactive inspections from March 2011 and will downgrade Approved Codes of Practice - which have a formal legal status - to guidance, which does not. Under the government's proposals, employers in 'low hazard' sectors and larger employers will be responsible for ensuring that their own workplaces are safe rather than having inspections by the Health and Safety Executive, who will only be allowed access to investigate after workers have been killed or seriously injured - too late to prevent accidents. The DWP's assesment of 'low hazard' industries include many that have notoriously poor safety records and death rates that show they are high risk, among them quarries and docks. The docks were one of the areas where Grayling's ban on proactive inspections came into force last year, and deaths have already risen; removing the Dock Regulations and ACoP will surely lead to even higher death rates. The 2010/11 HSE report shows an increase in deaths at work since the government came to power of 16% - and of 20% in the construction industry. Among those attending the protest were Liliana Alexa who played an active role in the campaign for the Tower Crane Regulations after her son was killed by a collapsing crane in Battersea, and several others whose husbands or sons had died at work. Few if any such deaths are 'accidents'; they invariably result from negligence, the imposition of unsafe working practices and a lack of proper care shown by management. 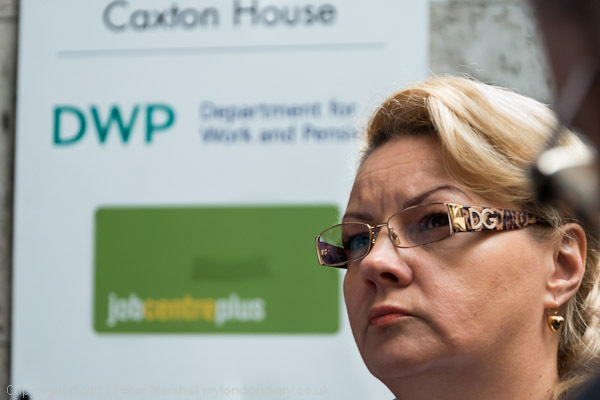 A small group including family members of those who have been killed went to the door of the DWP to ask if they could see the Minister for Employment but were informed that he was not in the building. But the protesters say that he has always refused to meet with any of the families of victims from workplace deaths. I photographed them while they were asking to go in, and was asked by the man in charge of the G4S security personnel not to photograph them. One of the security guards became quite angry with another person who was taking pictures, and threatened that he would take the camera and smash it. I asked the manager to prevent his staff from making threats, and he lied to me, saying that nobody had been threatened. G4S certainly need to give their staff some proper training, both in the law and in relating with the public. There were speakers from the three groups involved, as well as from construction union ACATT and other trade unionists supporting the protest, although the main speeches were to be later in the afternoon at a meeting to lobby MPs in the House of Commons. “We set up FACK up in 2006 to campaign for improvements in the inadequate system of enforcement, regulation and punishment of safety criminals that killed the people we love. But now this government wants to slash to pieces even that inadequate safety net, based on the lies that it’s a ‘burden on business’ and it is over enforced. We are here to say no one we loved was killed due to too much regulation or enforcement but the complete lack of either, and the real burden is on us. " She went on to point out that as well as bearing "the heartache of someone being killed by their employers’ negligence", the families also bear the majority of the financial costs involved, with the negligent employers bearing less than a quarter of them. "My son was killed when an unrestrained 18 stone barrier fell on him at a newly opened shopping centre, in contravention of the Construction Design and Management Regulations. FACK deplores the loss of any construction-related regulations, and is also shocked that the Dock Regulations could even be considered for scrapping as the death rate there is now running at up to 20 times the national average." The government's rationale that cutting safety inspections and regulations will improve productivity is undermined by recent research from Harvard Business School, where a study by Professor Michael Toffel published this May concluded that surprise visits by official safety inspectors are good for both jobs and profitability. But even if this were not the case, the levels of injury and death at work, particularly in areas such as the docks and construction are currently far too high, and breaches of the safety regulations and codes of practice are treated far too leniently in the courts, often to the consderable frustration of the Health and Safety Inspectors who find their long attempts to bring irresponsible employers to justice either fail or result in insignificant fines. We need tougher regulation and enforcement in this area rather than the removal of regulations and the failure to enforce them that Mr Grayling is pushing through. As the protesters stated (though some put it rather more strongly): "You Lie: We Die - so stop it, you’re killing us!" 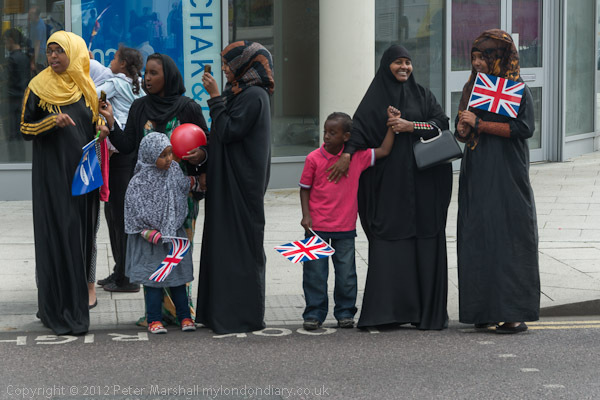 All pictures Copyright © Peter Marshall 2012, all rights reserved.